Why Are 50,000 South Sudanese Children on the Brink of Death? A man-made famine in South Sudan is brutal evidence of the limits of American nation-building in Africa. Juba, South Sudan—The soft glow of the dancing white lights is a dead giveaway. It’s Christmas in July at the US Embassy compound. Behind high walls topped with fierce-looking metal impediments meant to discourage climbers, there’s a party under way. Close your eyes and you could be at a stateside summer barbeque or an office holiday party. Even with them open, the local realities of dirt roads and dirty water, civil war, mass graves and nightly shoot-to-kill curfews seem foreign. These walls, it turns out, are even higher than they look. Out by the swimming pool and the well-stocked bar, every table is packed with people. Slightly bleary-eyed men and sun-kissed women wear Santa hats and decorations in their hair. One festive fellow is dressed as Cousin Eddie from National Lampoon’s Christmas Vacation complete with a white sweater, black dickey and bright white loafers. Another is straddling an inflatable killer whale that he’s borrowed from the collection of playthings around the pool and is using as improvised chair while he stuffs his face from an all-American smorgasbord. We’re all eating well tonight. Mac and cheese, barbequed ribs, beef tenderloin, fried chicken, mashed potatoes and gravy, green beans and, for desert, peach cobbler. The drinks are flowing, too: wine and whisky and fine Tusker beer. Just fifteen minutes away, near the airport in an area known as Tongping, things aren’t quite so wonderful. There’s no fried chicken, no ribs, no peach cobbler. At Juba’s United Nations camp for internally displaced persons (IDPs), they’re eating sorghum and a crude porridge made from a powdered blend of corn and soy beans provided by the United Nations World Food Program. Children at the camp call it “the yellow food.” “It’s no good,” one of them tells me, with a quick head shake for emphasis. I mention to a few of the embassy revelers that I’m heading several hundred miles north to Malakal. A couple of them assure me that, according to colleagues, it’s “not that bad.” But while we’re chowing down, an emaciated young girl in Malakal clings to life. This 1-year-old arrived at the hospital run by Médecins Sans Frontières (Doctors Without Borders, or MSF) at the UN camp there several days earlier, severely malnourished and weighing just eleven pounds. It’s uncertain if she’ll survive. One in ten children who arrive at the hospital in her condition don’t. As John Kerry, then-chair of the Senate Foreign Relations Committee, put it in 2012, the United States “helped midwife the birth” of South Sudan. The choice of words may have been cringe-worthy, but hardly divorced from reality. For more than twenty years, a bipartisan coalition in Washington and beyond championed rebel forces here. As the new nation broke away from Sudan, after decades of bloody civil war, the United States poured in billions of dollars in aid, including hundreds of millions of dollars of military and security assistance and sent military instructors to train the country’s armed forces and advisers to mentor government officials. It would be Washington’s major nation-building effort in Africa, a new country destined to join Iraq and Afghanistan as a regional bulwark of democracy and a shining example of American know-how. On South Sudan’s independence day, July 9, 2011, President Obama hailed the moment as a “time of hope” and pledged US partnership to the new land, emphasizing security and development. There’s precious little evidence of either of these at the UN camps and even less in vast areas of the countryside now teetering on the edge of a catastrophic famine. Since a civil war broke out in December 2013, at least 10,000 South Sudanese have been killed, untold numbers of women and girls have been victims of sexual violence and atrocities have been committed by all parties to the conflict. As a result, in the eyes of the United Nations, in a world of roiling strife—civil wars, mass killings, hunger and conflicts from Iraq to Gaza, Ukraine to Libya—South Sudan is, along with the Central African Republic and Syria, one of just three “L3 emergencies,” the world’s most severe, large-scale humanitarian crises. The country has also just displaced Somalia—for six years running the archetypal failed state—atop the Fund for Peace’s 178-nation list of the world’s most fragile nations. Today, close to 100,000 people are huddled on United Nations military bases around the country, just a fraction of the almost 1.5 million who have been put to flight and are waiting out the war as internal exiles or as refugees in the bordering nations of Uganda, Ethiopia, Kenya and Sudan. Such massive levels of displacement guarantee another nightmare to come. Since so many subsistence farmers weren’t around to plant their crops, despite fertile ground and sufficient rain, seeds never met soil and food never had a chance to grow. “At this point in time, because it’s the rainy season, there’s nothing we can do in terms of agriculture,” says Caroline Saint-Mleux, the regional emergency coordinator for East and Central Africa at CARE International. Above us, the sky is darkening as we sit in plastic chairs in the muddy “humanitarian hub,” a grimy ghetto of white tents, nondescript trailers and makeshift headquarters of aid agencies like the International Committee of the Red Cross and MSF, on the outer edge of the UN base at Malakal. Her organization did distribute a limited number of seeds to farmers still on their land earlier in the year, but can do no more. The planting season is long past. “It would be a waste of energy at this point,” she says, resignation in her voice. If it were dry, it would take only five minutes to walk from Deborah Schein’s office at the UN base in Malakal to the Médecins Sans Frontières field hospital in the adjoining IDP camp where 17,000 South Sudanese are now taking refuge. But the rains have turned this ground into fetid mud and an easy walk into a slip-sliding slog. Step inside that tent and you’re immediately in a ward that’s electric with activity. It’s hard to believe that this twenty-four-hours-a-day, seven-days-a-week hospital is manned by only three expat doctors and three expat nurses, plus a medical team leader. Still, add in various support personnel, local staff and the many patients and suddenly this giant tent begins to shrink, putting space at a premium. “The great majority of the hospital is pediatrics,” says Sancristoval, a compact dynamo from Madrid with the bearing of a field general and intense eyes that go wide when making a point. Not that she even needs to point that out. In this first ward, the fifteen metal-frame beds—blue paint peeling, thin mattresses, four makeshift bamboo posts topped with mosquito nets—are packed tight, all but two filled with mother and child or children. Some days, there’s not a bed to spare, leaving patients ill with infection and wracked by disease to sleep on whatever space can be found on the floor. Nyajuma weighed only eleven pounds on arrival. According to the American Academy of Pediatrics, the average 1-year-old girl in the US weighs more than double that. She was quickly started on the first of two powdered therapeutic foods to combat her severe malnutrition, followed by a regimen of Plumpy’nut, a high-protein, high-calorie peanut paste, four times a day along with two servings of milk. It would have been bad enough if her only problem were severe malnutrition, but that condition also exacerbated the skin infection beneath the bandages on her head. In addition, she suffers from kala azar, a deadly disease caused by a parasite spread by sandflies that results in prolonged fever and weakness. On top of that, she is being treated for two other potentially lethal maladies, cholera and tuberculosis. Her mother, resting beside her, looks exhausted, world-beaten. Pregnant on arrival, she gave birth five days later. She lies next to Nyajuma, listless, but carefully covers her face with her arm as if to shield herself from the harsh world beyond this bed. During her first week at the hospital, nurse Monica Alvarez tells me, Nyajuma didn’t crack a smile. “But now, voilà,” she says lifting the child, sparking a broad grin that reflects the sea change in her condition. Nyajuma is enduring the rigors of kala azar and tuberculosis treatments with great aplomb. “She’s eating well and she’s smiling all the time,” says Alvarez, who’s quick with a smile herself. But Nyajuma is still in the early stages of treatment. 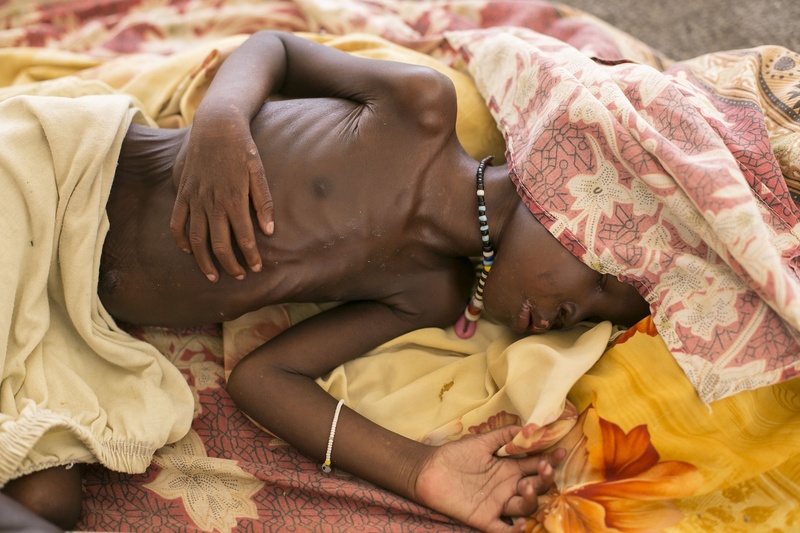 Once stable, severely malnourished children can be transferred to ambulatory care. But it takes roughly six weeks for them to make a full recovery and be discharged. And in today’s South Sudan, they are the lucky ones. One-year-old Nyajuma sits on a bed next to her mother at the Médecins Sans Frontières hospital at the UN Mission in South Sudan camp in Malakal. And Malakal is no anomaly. At the MSF feeding station in Leer, a town in adjoining Unity State, they’ve treated roughly 1,800 malnourished children since mid-May, compared to 2,300 in all of last year. North of Leer, in Bentiu, the site of repeated spasms of violence, the situation is especially grim. “Over five per cent of the children are suffering from severe acute malnutrition,” says CARE’s Country Director for South Sudan Aimee Ansari. “On the day I left Bentiu, CARE helped parents transport the bodies of children who had died from malnutrition to a burial site.” In all, according to the United Nations Children’s Fund (UNICEF) and the UN World Food Program (WFP), almost one million South Sudanese children under 5 years of age will require treatment for acute malnutrition in 2014. UNICEF projects that 50,000 of them could die. At the UN’s Tongping camp in Juba—where nearly 11,500 of the area’s tens of thousands of internally displaced persons are taking refuge—the food situation is “not very good at all.” So John, a 17-year-old resident, emphatically assures me beneath the relentless midday sun. “Outside, when I was living at home, we could have fruit or whatever we wanted.” Here, he eats no fresh food and no vegetables. Its sorghum and “the yellow food” mixed with sugar, oil and water. “This food doesn’t even compare,” he says more than once. UNICEF works with NGO partners to reach people outside the camps, but it’s a struggle. Nkwosseu walks over to a large wall map and begins to point out Nile River towns to the north like Wau Shilluk (currently suffering a cholera outbreak), Lul, Kodok and Melut. These, he says, are hubs where South Sudanese from rural areas go when faced with hunger. The reason is simple enough: the river is one of the few viable transport options in a country the size of Texas that has almost no paved roads and whose dirt tracks in the rainy season are quickly reduced to impassable mud. Even using the Nile is anything but a slam-dunk operation. Earlier this year, for instance, a convoy of barges transporting food and fuel to Malakal was attacked by armed men. Even absent the acts of rebels, soldiers or bandits, food barges are regularly delayed by everything from mechanical issues to drawn-out negotiations with local powerbrokers. Air drops are costly, impractical and—thanks to a lack of airfield infrastructure—often unfeasible. Security is minimal and so thousands of tons of food stocks have simply been looted. Even when road transport is possible, vehicles are attacked and food is stolen by both government and rebel troops, eager to feed themselves. When food supplies do make it to the river towns, many in need are unlikely to make it in from the water-logged countryside in time. Among African nations, South Sudan has had an almost unprecedented relationship with the United States. Aside from Liberia—a nation settled, hundreds of years ago, by former American slaves, whose capital is named after a US president—it is the only African country for which Americans have evidenced a deep bipartisan commitment and “longstanding humanitarian and political interest as well as a deeper kinship,” says Cameron Hudson, who was the director for African affairs on the staff of the National Security Council from 2005 to 2009. For all America’s efforts, the wheels started coming off almost immediately. “We’ve gotten pretty good at understanding what goes into building a state, institutionally, but as far as what creates a nation that’s actually functional, we fell short,” Taft tells TomDispatch. The United States, she says, failed to do the necessary heavy lifting to encourage the building of a shared national identity and sat on its hands when targeted interventions might have helped reverse worrisome developments in South Sudan. Still, Washington repeatedly pledged unyielding support for the struggling young nation. In August 2012, for example, then–Secretary of State Hillary Clinton, speaking in Juba, was emphatic that the US “commitment to this new nation is enduring and absolute in terms of assistance and aid and support going forward.” A year later, announcing the appointment of Donald Booth as President Obama’s Special Envoy for Sudan and South Sudan, Clinton’s successor, John Kerry, made special reference to America’s “enduring commitment” to the South Sudanese people. Lately, however, words like “enduring and absolute” have been replaced by the language of limits. Speaking in Juba just days before the July Christmas party, US Assistant Secretary of State for Population, Refugees and Migration Anne Richard drew attention to the fact that the United States had given generously to South Sudan, but that such assistance would be of little use if the war continues. “There is a limit to how much aid can be provided in a year with so many crises around the world,” she said. A scrawny black and white cat slips through a maze of legs moving from the rudimentary pharmacy to the examination room past the bed where Nyajuma sits. She’s putting on weight, two and a half pounds since her arrival and so, for her, things are looking somewhat better. But as the country plunges into famine, how many other Nyajumas will arrive here and find there’s not enough food, not enough medicine, too few doctors? How many others will never make it and simply die in the bush? That embassy party in Juba seems light years away, not just in another state but another world—a world where things in Malakal don’t seem so bad. It’s a world where choice cuts of beef sizzle and cold lager flows and the pool looks cool and inviting, a world where limits on aid are hard realities to be dispassionately explained and cursorily lamented, not death sentences to be suffered. From Iraq to Afghanistan, American-style nation building has crumbled, exposing the limits of American power. Before things are over in South Sudan, Washington’s great experiment in Africa may prove to be the most disastrous effort of all. Just three years after this country’s independence, two years after Hillary Clinton stood in this city and pledged enduring and absolute assistance, at a time when its people are most in need, the US is talking about limits on aid, about backing away from the country it fostered, its prime example of nation-building-in-action in the heart of Africa. The effects will be felt from Juba to Jonglei, Bor to Bentiu, Malek to Malakal.